Christain here. I'm going to start this post with a list of cars I drove this weekend: F430 Coupe, F430 Spider, and F430 Scuderia, Gallardo LP550-2, and a Gallardo LP560-4. It was a good weekend. 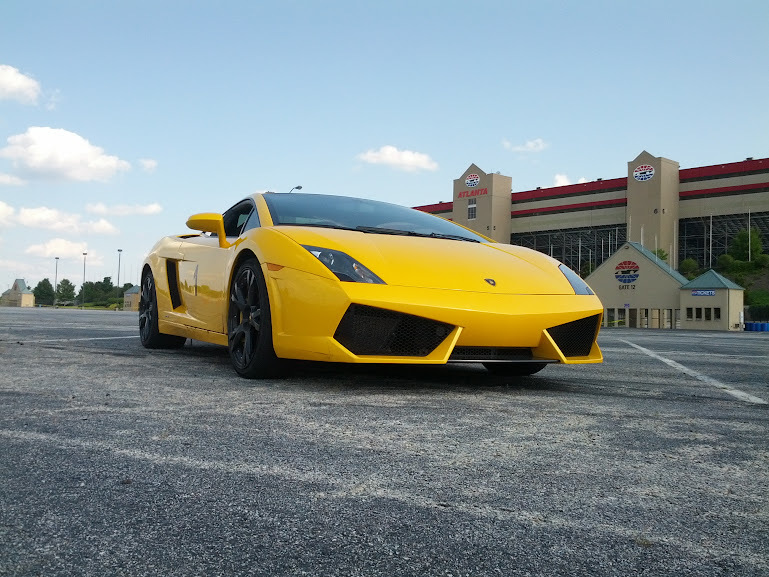 The backstory is after the jump, along with a regular guy review of the F430 and Gallardo. This opportunity came from my autocross experience. 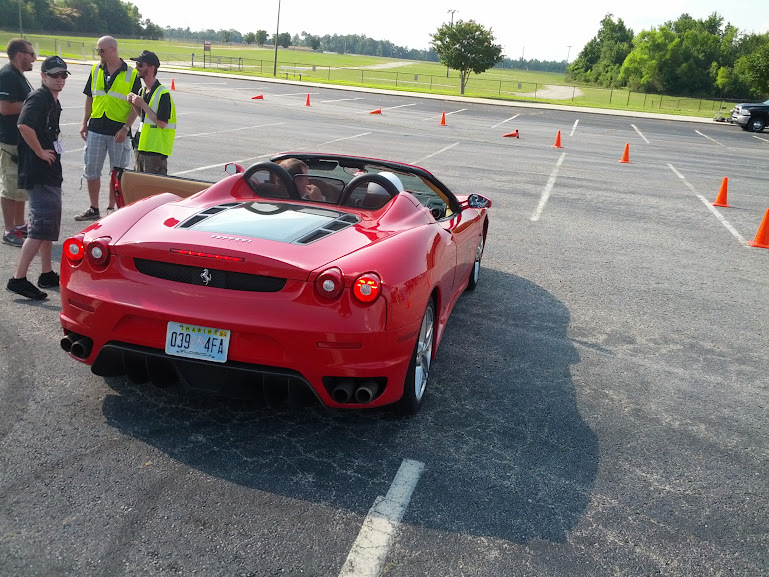 One of the companies that allows you to pay to drive an exotic car for a few laps came through Atlanta and needed instructors. They came to the local SCCA region looking for experienced autocrossers who were willing to spend a weekend riding in and driving Ferraris and Lamborghinis. Needless to say, there were a few people interested. It was actually a lot of work. Each day was 11 hours in the sun keeping the event organized while helping over 400 people get the most out of their 3 laps. We were paid, but the real reward were the 'Pro Drives'. Customers could pay to be driven around by one of the instructors in order to see the cars at their full potential. Over the 2 days, I took these cars on 27 hot laps around our autocross track. Lets start with the Lambo's. All of the instructors used the same word to describe them: Brutish. Their power hits you hard and the car struggles to contain it. My grin quickly turns to concern in the brake zones, however. The car is unsure and skittish under hard braking; especially the all wheel drive version. I was happy to be off of the brakes with the car still pointed forward. Things improved in the corners, but I was always wrestling with the car to keep it going in the desired direction. Understeer persists through the entire corner. It is with a sense of relief that I ease back into the throttle. That relief quickly turns to joy, though, and all is forgiven. The Ferraris by comparison have smooth throttle response onto the straight-aways. 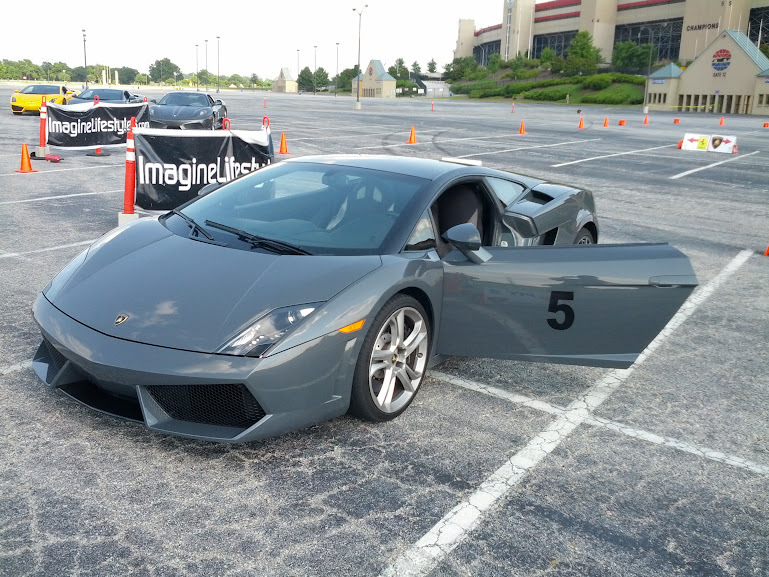 It lacks the raw punch of the Lamborghinis, but that is not to imply that the car is slower. The brakes on the F430 are wonderful. They grab hard and predictably while the car maintains composure. The transition into corner entry inspires confidence and the car remains stable through corners, allowing early throttle application. The sound of the engine is addicting. While in the Spider, the exhaust chases you around the track as you power through the gears. It is a nearly transcendent experience for a gearhead like me. Now for the shocking truth promised in the title: These cars are crap. Outside of the driveline, nothing on these cars works. Doorhandles literally fall off. Window motor switches break off. A/C compressors burn out. Seatbelt returns are completely worn out. 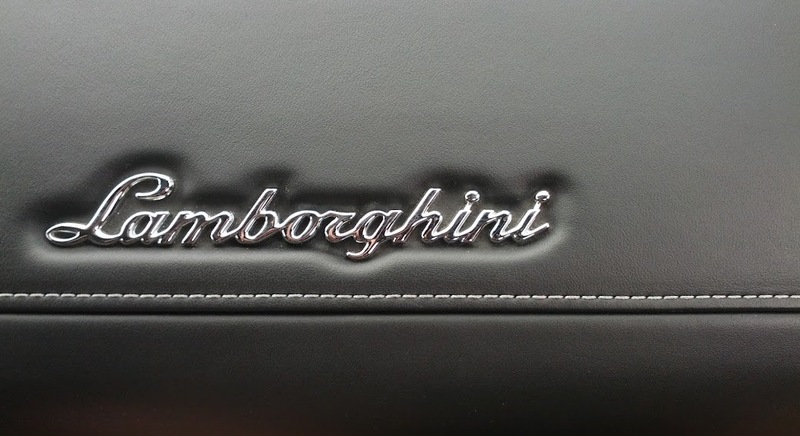 The seats in the Gallardo are uncomfortably hard. I'll admit these particular vehicles have a tough life, being driven by 40-50 people each weekend rather than twice a month, but this is ridiculous. This also does not explain why in one F430, pushing the window control up raised the window while in the other F430, pushing the window control up lowered it. Their quality control appears to be surpassed by nearly every major manufacturer in the world. It is quite clear that these cars are meant to be looked at and yearned for more than they are meant to be driven. After two days, only 3 of the 7 cars were still driving. This weekend was enough to remove any desire I had to own an exotic car. I'm perfectly happy paying (or in this case, getting paid) to drive one owned by somebody else. The Scuderia broke and left for the day before I could get a picture. With that mini-rant aside, I have one closing review. 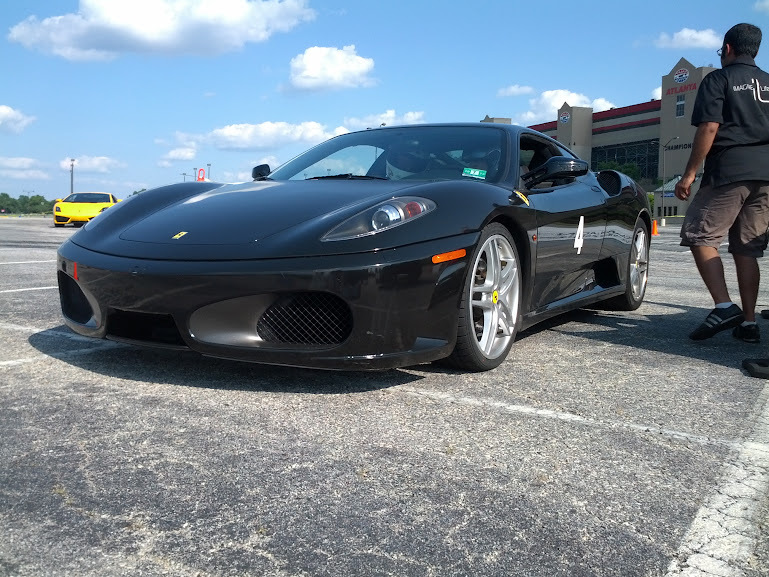 The F430 Scuderia is the first car I have driven that I can say is better than my Corvette. I prefer my Z06 to the Gallardo, the F430, Lotus Elises, and frankly every other car I have had the opportunity to drive. The Scuderia is different. Interior controls are minimal, the carpet is replaced with aluminum sheet, and the interior panels are bare carbon. It has a little more power and slightly larger brakes than the 430 in addition to the weight reduction. The sum of these changes is larger than the parts. The throttle is quick, and the torque nearly constant. This took me into the first corner at a much greater speed than planned. It didn't matter. The brakes are the best I have ever felt on a car - strong and predictable, decelerating the car in less distance from a greater speed than the base model. I had a big stupid grin on my face when I brought the Scuderia back to the grid. One of those grins that can't be forced and won't go away. Maybe this Ferrari is the one you're supposed to buy? The next lap, the car threw an error code, went into neutral, and had to be taken off for repairs. Guess not.